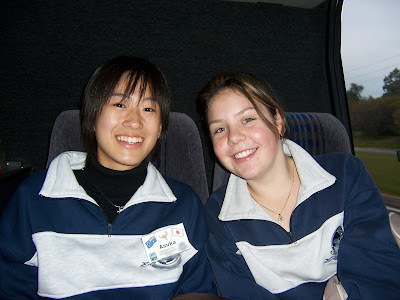 This is Renée and Asuka on their way in the bus to Cleland National Park yesterday. This is the first time that Renée has been able to go with the students on an out of school visit, they had so much fun, normally all the exchange students travel up their with their Japanese teachers on their own. I thought it was great that the Aussie kids were able to share this experience with them. Cleland is home for lots of animals, similar to Gorge (see post below). Asuka loves our animals. From Cleland they went to Hahndorf where they had lunch. Renée had a great time as did Asuka. Tonight they have gone star gazing with Scouts, Asuka was looking forward to it, she loves the stars, but said that at home it is difficult to see them with the pollution in the air. That is one thing that all our students have noticed when they have visited, how clean our air is and how wide our sky is, we really do take our open spaces for granted. Tomorrow she is going to Adelaide city for some shopping, what girl doesn't like shopping, she is quite looking forward to it. I have told her that she will feel like our city is sleeping compared to Tokyo, they have so many people there!